A few weeks ago, I had a customer who was having some issues with their Time Warner phone service and their fax machine. Yes folks, fax machines are still alive and well and have outlasted the likes of the Beeper and Floppy Disk. Anyway, while on the phone with one of their customer support reps, I was told about new Internet packages they were offering to certain residents of Hawaii. Being a geek by nature and a IT Consultant by profession, I was intrigued. The rep went on to tell me I could get phone and Internet service for $20/mo since I was already a Time Warner cable subscriber. At the time, my current ISP Hawaiian Telcom was charging me $60/mo for phone and DSL services so this was a pretty big price break. I asked her what kind of speeds they were offering with this package. That’s when she dropped a bomb on me and said I could get 200Mbps/20Mbps for that price. My mouth literally dropped as I didn’t think we had these types of speeds in Hawaii without opting for a really expensive Fiber option. She assured me that the area I lived in had just been upgraded to support these speeds and that they were now offering this package at the same price they were offering their old 30Mbps/5Mbps bundle. Seeing as I was currently only getting 11Mbps/1Mbps from my current ISP, I jumped on the offer. Almost 20x my current speeds for $40 less…who wouldn’t. 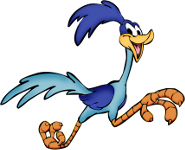 Now I’ve been in the industry a long time and have been a customer of Time Warner before so in the back of my mind I was a little skeptical if they could deliver on these promises, but I went ahead anyway. The rep told me the soonest they could get a tech out to upgrade me would be a couple weeks. This was fine with me as it gave me some time to plan the cutover. So now that I was going to be getting a blazing 200Mbps down, I was going to need a new router. You may be wondering why I would need a new router if all I was doing was switching ISP’s. 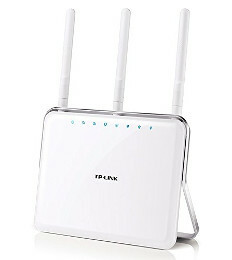 Well, some of you may be shocked to learn that the majority of routers on the market today cannot support these higher tier connections. Let me explain. If you’ve purchased a Desktop computer in the last 5 to 10 years, you’ve probably seen Gigabit Ethernet as a standard feature of most computers. For those that glossed over that feature and were seduced by words like Core i7 and SSD, ethernet ports ethernet ports are the jacks on the back of your computer you plug a cable into to get Internet access…the ones that look like big phone jacks. Gigabit Ethernet is a type of port that support speeds up to 1000Mbps, more than enough to handle my new Internet connection. 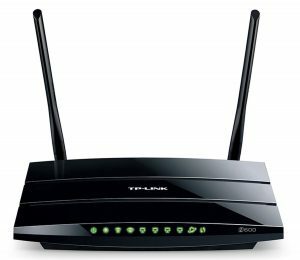 The problem is that while most computers come standard with Gigabit Ethernet, most routers don’t. Even the ones that advertise having gigabit speeds often offer Gigabit LAN ports while outfitting their WAN ports with slower and ironically named Fast Ethernet ports which only support up to 100Mbps. That’s 10x slower than a Gigabit port. 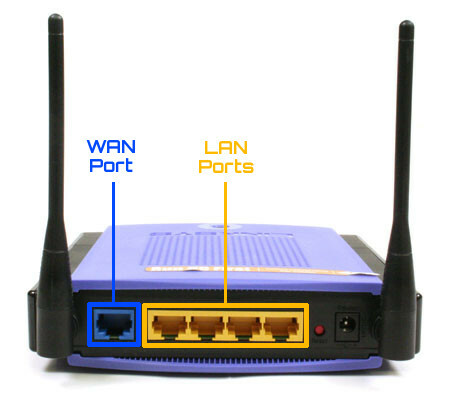 If you’re still a little confused, a WAN port is the lonely isolated jack on your router that connects to your modem. 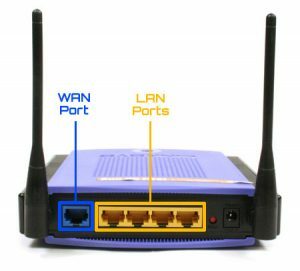 LAN ports are the happy little ports on your router that usually appear in groups of 4 and connect to your computer. If you bought your router from Best Buy or your local chain retailer, odds are your WAN port is only Fast Ethernet and the fastest Internet speed your router supports is 100Mbps. If I were to use this type of router after cutting over to my new service, I’d be wasting half of that beautiful 200Mbps pipe. However, instead of purchasing a new Gigabit router, I went in a slightly different direction and actually built my own router using a small, low-wattage, fanless PC with 5 Gigabit Ethernet ports running my beloved OS, Linux. This is definitely overkill for most users, but this machine doubles as a server as well. I’ll save the build details for another post, but if you’re curious, here’s a peek at the hardware I purchased. Just add your own Hard Drive, heat and serve. For those of you not as adventurous as me who want their faster Internet speeds with as little hassle as possible, you’ll probably want to purchase a new router that comes outfitted with that ever important Gigabit WAN port. Luckily, routers with Gigabit WAN ports are becoming more commonplace as ISP’s offer faster and faster speeds, although most entry-level routers will still lack this feature. Below are a couple solid choices if you’re in the market for one. I was going to list a Wired-only option for those who are happy with their current wireless router or don’t have a need for wireless, but I’ve found that the standard 5-port wired router is pretty much extinct. Most people want the convenience of wireless in their homes so manufacturers have just stopped producing wired-only options. You can still find a few out there, but they are a lot more expensive then their wireless cousins. If you insist on having a wired-only router and think that wireless is the tool of the devil, I suggest buying a low-end wireless gigabit router and disabling WiFi through its web interface to achieve the same effect. Some routers may even include an exterior button that allows you to disable WiFi on the fly, not to be mistaken for ones with a WDS button. If you’re lucky enough to get a 1000Mbps Internet connection from your ISP, the CPU and Memory of your router may become a limiting factor even with a Gigabit WAN port. Something to keep in mind if your current gigabit router never seems to pull your full download speeds. Either that or you’re just too fast for the rest of the Internet…first-world problems. The day had finally arrived for the cutover and although I was excited to start downloading entirely legal files in the public domain at lightning speeds, I was still worried that something would go wrong. I took the technician underneath my house where all the coax lines were split. There was a mess of wires, amps and splitters he had to work through, but eventually he was able to get a solid signal to my modem. While he was busy cabling and splicing, we got to talking about the new Internet packages Time Warner was offering. He told me that even though customer reps have been assuring customers that these speeds were available in their area, 5 out of the 7 customers he setup didn’t qualify for these new packages. It appears the entire island is supposed to be upgraded to support these new speeds by the end of the year, but he said there are a lot of areas that are still on the older system. My heart sank, but I still had a bit of hope because I was the first person in my neighborhood he was doing a new install for. The moment of truth had arrived. He hooked up my new modem, ran some speed tests and gave me the bad news. I was only getting 80Mbps down. He quickly fired off a text to their IT department who replied that they were experiencing issues with their internal network which was causing the slowness. He was very apologetic about the entire situation and told me to call their customer service if my speeds didn’t improve. He did say I was getting speeds faster than the old system allowed, so he was pretty sure my area had been upgraded. The technician went on his way and I was left feeling a bit disheartened. I decided to jump on my computer and run my own speed tests to see if the problem was isolated to Time Warner. Like rays of sunlight cutting through dark skies, I saw the most magical thing a geek like me could dream of…233Mbps. Now if you’re testing your Internet connection from those flash-based websites like speedtest.net, you need to take those results with a grain of salt so I held back my giddiness and ran some real world tests. Using completely legitimate, aboveboard downloading techniques, I found I was in fact pulling beyond the maximum 200Mbps. Oh Happy Day! I gotta tell you, I thought 11Mbps was fast when I first got it. Experiencing 200Mbps took it to an 11. Not 11Mbps which I was already on, but an 11…you know from Spinal Tap…which I still haven’t watched all the way through. I should probably downlo…..I mean legally stream that movie from Netflix or some such legitimate paid service. I do have the bandwidth for it. If you live in Hawaii and are excited to get these new speeds, I would definitely ask around and see if anyone else in your area has been able to upgrade to these new packages before getting your hopes up. The good news is that these packages replace their existing Internet offerings so if you’re an existing Time Warner Internet subscriber, your upgrade should be free. You will have to swap out your modem for ones that can handle these faster speeds though. You know, the ones with…*drum roll*…Gigabit WAN Ports of course. They’ll also need to support DOCSIS 3.0, but that’s a whole other topic and it’s not as clever as that last line. *UPDATE: A few days after my cutover my modem decided to drop all of its settings. I had my modem setup in bridging mode so it doesn’t act as a router, but it decided it missed being a router and reverted back. I called Time Warner support and they were able to remotely configure it back to a bridge, but the tech said that this has been happening to a few customers. If you were unlucky enough to have received an Arris TG1672, which most people who upgraded have, and you’re experiencing this issue, I would call Time Warner support and see if they have a different model available. As of now, I’m still on the Arris and will have to keep monitoring the situation and hope it doesn’t happen again. *UPDATE #2: The tech I had talked to about my modem resetting said my line’s transmit signal was out of spec and it could be affecting my upload speeds. A tech came out to my house and ran a line directly to my modem bypassing an ancient splitter that had been installed in the 1920’s. I was getting about 16Mbps before and am now getting over the promised 20Mbps up. Yay! I have not been paid by Time Warner or any other company mentioned in this post. If you’re happy with your current ISP, I am in no way advocating switching over and receive no compensation for getting people to do so. This post was written purely for informational purposes. I am however, totally open to any of these companies paying me. I patiently await your response with my hands out and pockets empty.